"Of all the sites out there, the LPA by FAR has the most extensive resources, the most knowledgeable help, the most expertise, and is quite possibly the best real estate site I've used in my career." "My LPA Membership has saved me from so many expensive tenant problems, it has already paid for itself many times over." The LPA not only lets you share your experience with other landlords, but it will also help to answer your questions. The Web site was founded by John Nuzzolese, and he is a “nice guy” like we were when we started. He learned many lessons the hard way, like we did, and so you will benefit greatly from his experiences, and from being part of this group. Sandy Midea, Author of "A Fool's Guide to Landlording"
"The LPA Lease has become my favorite lease, and enforcing it with the Essential Forms is even better. Managing my properties (tenants) has become much easier." Jack Klein, LPA Member since May 2001. "The question should be ..." "Can you afford not to join The Landlord Protection Agency? I'm very thankful for all The LPA has done for us. At first we were intimidated by our tenants and the whole process of leasing and managing our rental property. Now we have 3 rentals with excellent tenants!" "I'd like to thank Mr. Nuzzolese for sharing his landlording knowledge with us. I find it refreshing to be able to get down to earth articles and real life helpful advice on the LPA website. "I cannot express how your products have made my job so much easier. I have peace of mind now knowing that I am protected by the verbiage you have in your contracts. Thank you so much." The rental forms on this page are all free for immediate use to assist you in various landlord tenant situations. Just click on the forms you want and download them. All sample rental forms are in Adobe Acrobat format (PDF). If you don't already have it, you can download Acrobat Reader for free. This is a standard lease addendum form used for making additional information or clauses a part of the lease agreement. When meeting with tenants to do a lease signing, we often think of certain rules or clauses we'd like to add into the lease agreement. Most leases and rental agreements do not provide room for extra lease clauses (unless you are using The LPA Lease Agreement in word processor format) The lease addendum form can easily be filled in at the time of lease signing with topics that are important to you that may not be already included in the lease agreement form. It's a handy form to have in your folder if the need arises to add any special clauses to your lease. This is one of the popular Rental Binders used by many Realtors. Similar versions of this form are used by landlords and real estate agents across the US. Although many people actually use it as a basic rental agreement, it's not really meant to be a rental agreement or rental application, but is a pre-contract form used as a binder receipt to show an offer has been made with an earnest money deposit. Upon written acceptance of the offer by the owner/agent of the rental, it becomes a binder, whereby it is agreed that the rental will not be rented to anyone else before the agreed lease signing date. When not using the LPA Rental Application, this form is especially helpful to rental agents and real estate brokers who collect their real estate commission from the tenant or the landlord because it provides for a written agreement to pay the rental commission. This handy prospect card will help you ask the right pre-screening questions before deciding whether to set an appointment with the prospective tenant. Be sure to check out The LPA's Pre-screening Tenant Prospect Card html code to insert into online ads such as Craigslist, Trulia or The LPA's Rentals Available. Some owners want a shorter, less formal Rental Agreement. The Basic Rental Agreement sample is not as basic as many that we've seen used by private landlords, but it is still very basic compared to the extremely detailed LPA Lease. This Free Rental Agreement contains a few essential basic items such as Late Fees, Security, Renter’s Insurance for Landlord Protection and keeps it short and easy for those of you who may insist on a quick and simple one page rental agreement. This landlord flow chart is a simple, free, easy to follow guide to take you through the steps from first contact with a tenant to signing a rental agreement. is a combination form which can be used as a lease renewal form or a tenant's notice to vacate. The form provides for a rent increase, as well as the preservation and extension of all the terms and conditions in the lease agreement. The landlord should send this form to the tenant at least one or two months before lease expiration to give the tenant an opportunity to consider any rent increase and to respond with enough notice time to vacate or renew tenancy according to lease requirements. Sometimes your delinquent tenant doesn't really grasp the consequences of a full blown eviction. This eviction letter explains the immediate and future drawbacks to the tenant caused by the process of eviction and it's aftermath. This form is used by the tenant give proper written notice to the landlord when the tenant is vacating and states that the tenant will cooperate with showing the property for re-rental or sale. It includes a place for the tenant to provide a forwarding address in order to receive any due security refund. This form helps to reinforce proper move-out procedure. We always staple a copy of this notice to the back of the tenant's lease to be used when the time comes for the tenant to give notice to vacate. Collect your rent in cash? Whether it's in cash or check, feel free to print up your blank rent receipts right here. Alerts the tenant before or after tenancy what kind of move-out charges he or she can expect for damages, cleaning or neglect caused as a result of tenant's occupancy. Some landlords send this form along with the Security Deposit Settlement to show how certain deductions from the security were calculated. What many tenants consider "normal wear & tear" are really damages and neglect that they should pay for. View or print the Security Deposit Return Chart. Avoid lawsuits and comply with state security deposit return laws. Know your state's time limit to return the security deposit and/or notify tenants of deductions from deposits. View or print the State Specific Notice Period Chart to determine the proper amount of days notice needed to cure the default for non payment of rent. Used for Notice to Pay Rent or Quit form. Most states have a required notice period regarding a landlord’s right to enter the rental premises. There are many reasons a landlord may need to enter a rental property. Some of those reasons include: Periodic Inspection, Showing to prospects for re-rental or sale Repairs & Maintenance Pest Control Service, Appraisal, Insurance Company Inspection, Town Inspection Tax assessor, Emergency - danger to life & property, etc. How long does a landlord have to begin collection a debt from a tenant? This state chart makes it easy for you to look up your state's Statute of Limitations. Rights and circumstances a military member has to terminate a lease. Important steps to preparing your rental for winter can save you big bucks and avoid headaches and repairs. This free form is now required by HUD on all housing built before 1978. Landlords and real estate agents must disclose whether or not they have knowledge of the existence of any lead base paint hazards on the premises. This booklet explains to tenants in detail all the hazards associated with lead paint. It must be given to tenants when they rent pre-1978 real estate. You can view the entire booklet here through Adobe Acrobat Reader. You can also print it on normal letter size paper and put the booklet together. After printing, you can also reproduce larger quantities of it on a copy machine in color or in black and white. A Brief Guide to Mold, Moisture, and Your Home. This booklet from the EPA tells you and tenants what you need to know about mold and how to treat it. You can view the entire booklet here through Adobe Acrobat Reader. You can also print it on normal letter size paper and put the booklet together. After printing, you can also reproduce larger quantities of it on a copy machine in color or in black and white. Also, be sure to give your tenants The LPA's Mold Addendum along with your lease agreement. FREE Radon Booklet, "Homebuyers Guide and Sellers Guide to Radon"
Radon Is a Cancer-Causing, Radioactive Gas You cannot see, smell, or taste radon. But it still may be a problem in your home. When you breathe air containing radon, you increase your risk of getting lung cancer. In fact, the Surgeon General of the United States has warned that radon is the second leading cause of lung cancer in the United States today. If you smoke and your home has high radon levels, your risk of lung cancer is especially high. This informative pamphlet is ideal for landlords to provide to their tenants. It will enable them to better prevent, detect, or solve a bedbug problem. Bed bug infestations have become a serious problem in housing throughout the country. HUD Insured and Assisted Multifamily properties are not immune to infestations. This Notice provides information and references to best practices regarding the prevention and control of bed bug infestations. It also provides guidance on the rights and responsibilities of HUD, Owners and Management Agents and tenants with regard to bed bug infestations. FREE Fire Safety Guide: Get Out Safely! More than 4,000 Americans die each year in fires, and 20,000 are injured. Deaths resulting from failed emergency escapes are particularly avoidable. The U. S. Fire Administration (USFA), a part of the U. S. Department of Homeland Security, believes that having a sound escape plan will greatly reduce fire deaths and protect you and your family’s safety if a fire occurs. Educate your tenants on fire safety! The Homeowner’s Guide to Earthquake Safety was developed and published by the California Seismic Safety Commission. Even though this is not a "landlord form", it is useful and helpful legal information for anyone who owes money. Even landlords are in debt and need to know what to do when creditors infringe on your legal rights. Is a convenient and helpful touch appreciated by many tenants. It is a form for you to provide new tenants with important telephone numbers and information relating to the rental and neighborhood they are about to reside in. Most tenants should not be allowed to paint. Sometimes it can be a tremendous relief for the landlord not to have to deal with painting, though. If you want your tenants to do the painting, it may be helpful to have them follow some instructions on how you want it done. Many of us have seen just what some tenants will do with a paintbrush! When your lease provides for annual increases, often many tenants forget to send the increased amount of rent at the scheduled time. This is a simple reminder that their rent increase is already agreed and scheduled to increase. Send during the month previous to the increase. Is a form that shows a measured reading of fuel so that the landlord can charge the new tenant fairly for the oil being conveyed to the new tenant with the rental property. Is an addendum to the lease agreement. It specifically covers the tenant's responsibilities concerning the use of a waterbed in the dwelling. Sometimes a tenant may request a letter of recommendation, and you have to sit down and compose a letter. Some of us are more than happy to write letters, while many landlords find themselves overwhelmed with too many tasks to accomplish at once. This is a time saving letter for tenant recommendations. In the event you refund security to a tenant in person, this form is a receipt and a release of any future claims by the tenant. The Key Receipt is a simple receipt signed by the management/landlord given to the tenant upon return of keys to the rental. Many landlords require the use of a key receipt in order to document the official return of possession of the premises. This is a management form that many management companies and landlords use whenever performing repairs or work on an occupied or unoccupied rental. When it is occupied it is preferable to have the tenant sign the work order as an acknowledgment that the work is being done. It is also wise to document work agreed to when employing a handyman to do work on your rentals. Required window guard notification for applicable leases in NJ State. Required disclosure for applicable leases in NY State. Inform your tenants of proper emergency procedure in the event of a hurricane. This checklist helps tenants prepare for their own personal safety, evacuation and survival while also preparing the rental property for minimal damage in a hurricane emergency. This screening tool was created especially for online rental advertising. You can use this on Craigslist or TheLPA.com and screen the e-mail responses to your rental ad. Pre-screening ad responses has never been easier! The Specialized Landlord Forms listed below are available as a specially priced package or sold individually from The LPA's Essential Forms Management System at extremely affordable prices, all downloadable in Microsoft Word and AdobePDF. 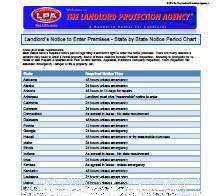 All Essential Landlord Forms are included FREE with LPA Membership!